(This section is for Kitely users.) First, login to any Kitely world. Open the World Map, and in the search field enter the Hypergrid address of a region that isn’t in Kitely. For example, enter hg.osgrid.org:80:Wright Plaza to visit OSGrid’s central region. Then, click Teleport. Remove or replace the No-Export items, and then you’ll be able to teleport out of Kitely. Hint: the default avatar that every user gets when they join Kitely contains only Exportable items, so you can wear it in order to teleport out of Kitely. If you’ve deleted that outfit then you can get other Exportable outfits in the Kitely Welcome Center. A note to content creators: now that the Hypergrid is enabled, Exportable clothes and body parts are going to be in greater demand than ever. Please consider enabling Export on your products, if you haven’t already done so. Login to your home grid, open the World Map, and in the search field enter the Hypergrid address that you found above. Finally, click Teleport. Kitely worlds are loaded on-demand, so if the world that you want to visit is currently offline then you’ll be teleported to a Transfer Station while the world is being started (this usually takes only a few seconds). Once the world is ready you’ll be teleported to it automatically. In this update we’ve automatically converted any worlds that were open to Regular users to be open to Hypergrid users as well. We recommend enabling Hypergrid access to any worlds that aren’t private. This lets more people visit your creations, and it also makes the world more visible because worlds that are open to the Hypergrid appear first in the Explore Worlds page. We also recommend making all Hypergrid enabled worlds Fixed-Price Worlds (instead of keeping them as Metered Worlds). This will ensure that Hypergrid users will be able to continue visiting your worlds even if you run out of Kitely Credits. A few weeks ago we started looking for an icon that can represent the Hypergrid in our user interface, and were surprised to learn that there was no standard Hypergrid logo. We therefore asked the Kitely community to help us design a logo that people will be able to associate with the Hypergrid. Kitely is unique in allowing Hypergrid access to users’ worlds, while still protecting content from leaving the grid without authorization. Objects and items in Kitely are considered either Export or No-Export, and only Exportable items may leave Kitely. 2. For objects and items that weren’t purchased from Kitely Market we use the following logic: if the item has Copy and Transfer permissions (abbreviated as “CT”) then the item is exportable. If it doesn’t have CT permissions then it’s not exportable. For Kitely users, we prevent No-Export items from being added to the user’s “My Suitcase” folder. This folder is special because only items in the Suitcase are available when a user teleports to another grid. Therefore, by preventing No-Export items from being added to this folder we prevent them from being taken to other grids. For Hypergrid users, we prevent No-Export items from being added to any of the user’s folders. The avatar’s appearance is a special case. The appearance contains several types of items: Body Parts, Clothes and Attachments. The reason the appearance is special is that an avatar may wear items that appear in any folder, not just the “My Suitcase” folder. Since users can wear No-Export items, we had to add further protections beyond just the “My Suitcase” folder. Here’s how we protect No-Export items that are being worn by a user from being taken out of Kitely: when a Kitely user attempts to teleport out of Kitely we check that all of their Appearance items are exportable. If they’re wearing any No-Export items then we prevent the teleport. This was explained in more detail in a previous section, “How to Teleport Out of Kitely”. When you view an object’s properties in the viewer, some viewers display an Export permission next to the Copy, Transfer and Modify permissions. This feature was added in the past to support an Export permission in OpenSim, but unfortunately that feature isn’t ready for production use. Kitely implements export controls in a different way, so the Export permission that you may see in the viewer should be ignored: it doesn’t reflect the true Kitely export permission, and changing the checkbox will have no effect. There is a known problem with OpenSim that we wanted to mention: the first time you try to teleport to a new grid, especially if you’re wearing a complex avatar, the teleport may fail and you’ll remain in the current region. This happens because the destination grid has to load all of your avatar’s assets, and this can take so long that the teleport times-out. If this happens then simply try to teleport again: the second attempt will probably succeed, because by then the grid will already have your assets. This problem isn’t Kitely specific but we’re bringing it to your attention so you’ll know what to do if you encounter it. Kitely developed its own cloud-based inventory system, which provides Kitely users with superior performance and reliability compared to that provided by the regular OpenSim inventory. These benefits continue to be available to you when you travel the Hypergrid with your Kitely avatar, since Kitely continues to manage your avatar’s inventory even when you’re visiting other grids. 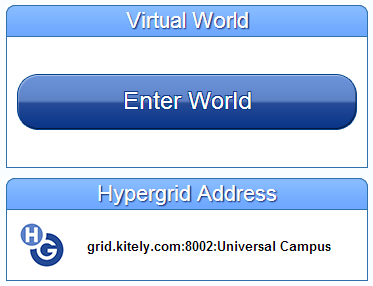 Enabling Hypergrid access in Kitely has been a massive project, and we’re very happy that Kitely users can now go forth and visit other grids, and other grids’ users may visit the wonderful worlds that have been created in Kitely. As always, please let us know if you find any problems.